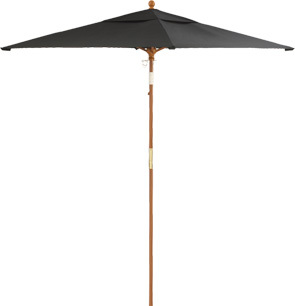 Eight reinforced resin composite ribs support the Outdura® solution-dyed performance fabric atop a 1-1/2" Diameter wooden pole to comprise these 6-1/2" square market umbrellas. The unique process which includes the introduction of UV stabilizers along with the dye with fiber is still in viscous form to lock the color in. Fabric stands up to sun as well as it does to chlorine bleach. In addition to colorfastness another great feature is that the acrylic fabric will not support the growth of mildew. Optional 1-1/2" diameter extension is available to give more height for use with bar height patio tables. Push-Button mechanism attachment allows for quick transition to and from standard height.